This silver plate tea set included a teapot, coffeepot, sugar, and creamer with gold plating on the inside. It arrived black with tarnish. The knob on the teapot lid was also broken off. When antique silver is very black and tarnished it can be a good sign that the silver plating is still intact. The transformation is quite remarkable. Even the gold plating in the creamer looks great. Repairing the knob I used sterling silver wire so the repair was more attractive and stronger. 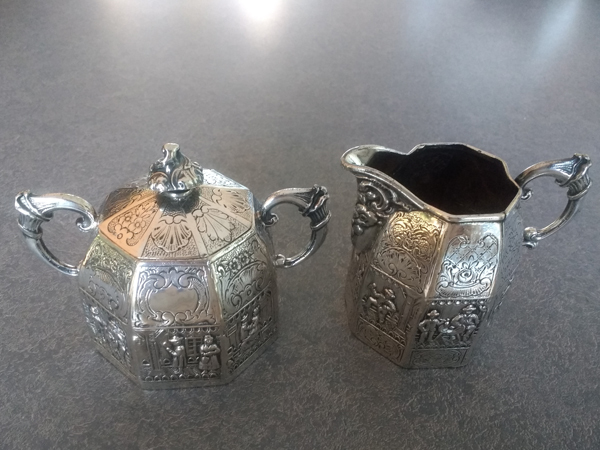 The customer said, “I have such gratitude to you for restoring this piece of family history.” This tea set was a 25th wedding anniversary gift in 1881. 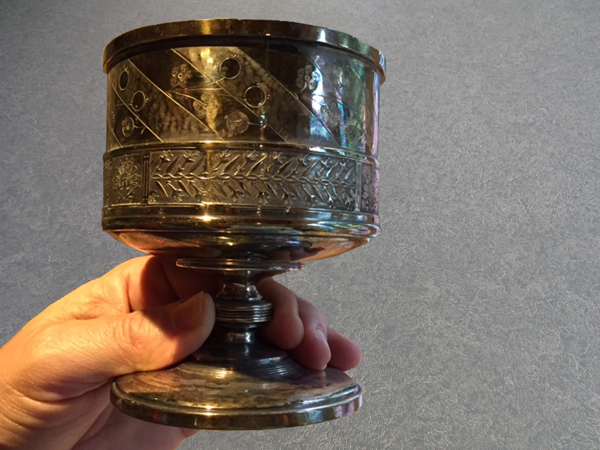 This Reed and Barton silver plate goblet was black with tarnish. To avoid the expense of silver plating, the cup was very carefully polished to preserve the silver plating, yet restore it's appearance. After it was polished the decorative details are much more visible. For a silver plated cup that is about 150 years old it looks amazing. This is not a do it at home polishing job. When silver plating is literally black with tarnish, it is very difficult to remove the dark black oxidation. WARNING: Do not use dips or recipes you find online for removing tarnish. They will etch the silver plating leaving it frosty white. This silver plate white metal epergne arrived in perfect condition but it was dull with tarnish. After polishing, the elaborate details of this 19th century epergne are more visible. The hummingbird on both sides is a fabulous feature of the epergne along with the small bee on the flat surface. Traditionally an epergne would be a centerpiece on the table to hold flowers or fruits. Originally, this would have had small glass dishes that were missing. Fortunately, the customer had small silver plate dishes that fit perfectly and were re-purposed for a new use. A very light touch when polishing silver plate is necessary to preserve the plating, but the final result is always a little unpredictable.